A permanent spot for the stalwart taco traders. 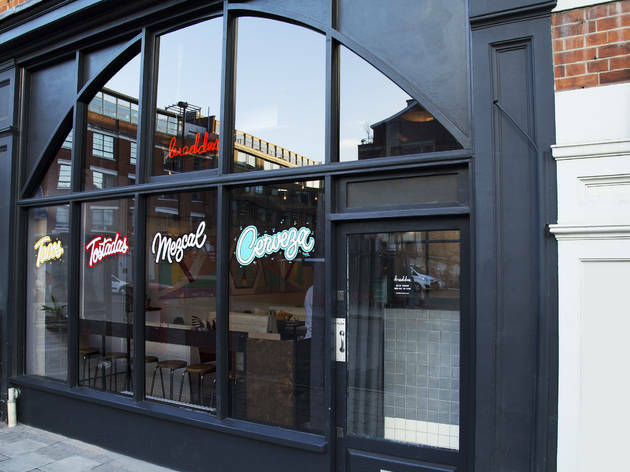 Space-wise, Breddos Tacos’ spanking new Clerkenwell hub may only be a slight upgrade from their former home at Dinerama, but the teensy spot still marks a helluva leap from those market origins. 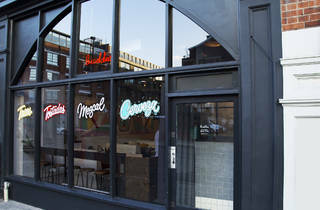 Potted succulents, bold prints and a wall of disco records colour up the busy room, with informal, communal seating options to suit what is still ostensibly street food. First up: queso fundido, a melted cheese dish with green chorizo, a subtler alternative to the typical ancho-heavy sausage. I enjoyed the twist, but the bubbling queso rapidly solidified at room temperature, so no dithering. From here on in, tacos dominate the menu. 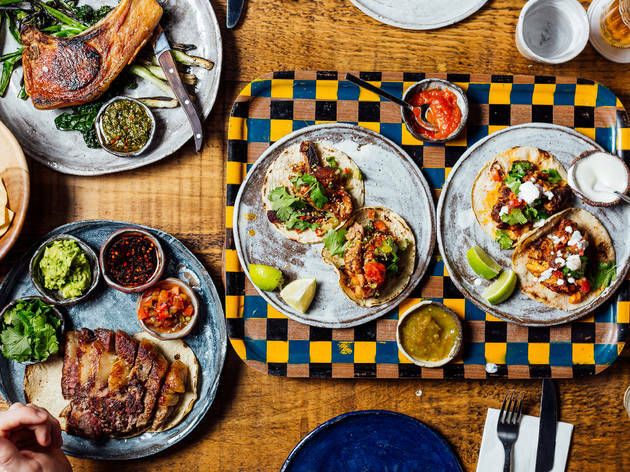 Make no mistake – these are some of the most creative soft shells in town, blending trad Mexican salsas with global ingredients: from the masa fried chicken, made famous in their stall days, to a pig’s head cochinita pibil, the nicely fatty meat served with a fiery Mayan ‘x ni pek’ salsa. A wood grill adds further intrigue. We shared smoky ribeye beef, pink medallions splayed across two tortillas, served with shiitake mushrooms and a tangy IPA salsa – mild and earthy flavours in place of your usual chilli and lime. The standout was a pulpo-topped tostada, the crunch of the tortilla clashing beautifully with slippery chunks of octopus, punchy Sichuan flavours balancing with rich bone marrow and acidic black vinegar. Yup, these guys are tearing up the cookbook. 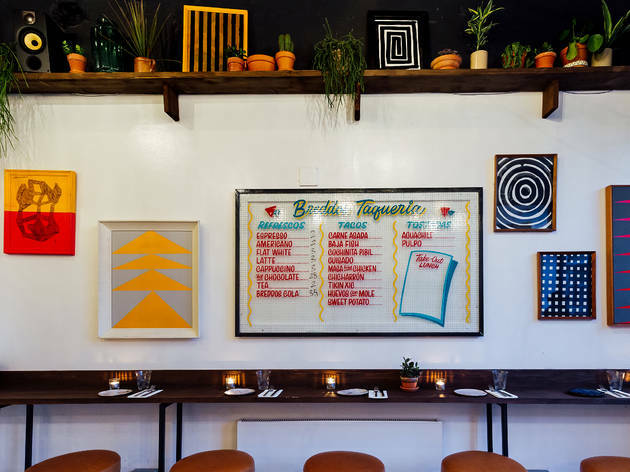 Breddos is still getting up to speed (quite literally when it comes to the music, with long silences between tunes), and some of the staff lacked a grasp of the menu’s fundamentals. But holy guacamole, are they shaking up an already healthy taco scene. Never mind Mexican, this is cross-continental food geekery. Mon-Sat midday-3pm, 5pm-11pm; Sun closed. 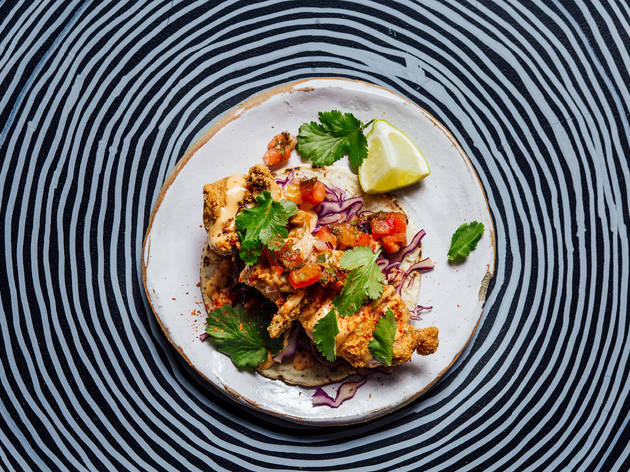 Hello delicious Mexican food in the heart of London! The Breddos Tacos restaurant may be small but make up for with delicious (but pricey) food, excellent quick service, and a colorful, vibrant atmosphere. While yes the tacos portions are quite small they sure are delicious and we loved the lamb. Breddos Tacos is definitely not a restaurant to miss! Outstanding service! I love me some tacos and have been wanting to try Breddos for a while! Finally convinced some folks to indulge me and went for dinner. It was so delicious! The Masa Fried Chicken taco is so good I ordered two (perfectly fried chicken with a creamy and spicy sauce!) and the Pork Pibil one also had me at hola! I could have foregone the Fried Egg one (it lacked seasoning and was essentially a fried egg on a tortilla) for another pork taco but with so many different taco types you just sort of want to try them all. Staff are lovely and the spot's got a lovely buzz. Portions are small and prices are reasonable but add up quickly as you're definitely going to be wanting more! Severely overhyped and overrated. Have been wanting to try for ages but it is small so very hard to get into (no bookings). Finally made it one Friday and although it was fine I would have not been able to distinguish between the food here and Wahaca in a blind taste but my wallet would have been much happier at Wahaca. 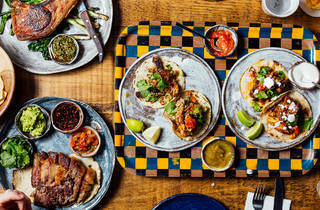 Tacos - or my favorite savory bundles of joy, are finally on the rise in London. Breddos is a super cute little joint with a communal table, booths and a row of bar-like stools facing the window. I headed here on a Monday lunch and managed to get in, well fed and out in less than an hour. My friends and I ordered pretty much everything on the menu and shared between the group of us. The baja fish taco is to die for, but you can easily say that about any fried foods. The star of the show was definitely the pork belly taco, with a great play on mexican-asian. Their ice-cream selection is perfect for this temperamental London weather, putting a smile on your face even if its pouring. Great little taqueria! Good service and delicious food. Taco servings were on the small side and relatively ££ but I enjoyed being able to try a range of tacos and you will too if you are a taco addict like myself. Don't forget to give the vegetarian options a go - they do not disappoint. I went for lunch at Breddos Tacos at 12:00 on a Sunday when the menu was a mixture of brunch and lunch. The place was already nearly full when I arrived. Being vegetarian, I ordered the duck egg taco, which was the cheapest on the menu, at £5 for one. It had a fair bit of spice to it, and after first attempting to eat it with my hands, I had to resort to a knife and fork. The taco arrived really quickly, but then I had to wait about 15 minutes for the churro french toast to arrive. It looked nice, with berries and caramel sauce on top, but the “churro” part tasted quite dry. The music was fun and upbeat, but slightly too loud to be visiting with a large group over it. The service wasn’t overly friendly - they were all rushing around since one of the servers hand’t shown up for their shift. There is a mixture of bar, communal table and booth seating. Despite being quite a small restaurant, they manage to optimize the space to fit a surprising amount of people in. There was however only one toilet for the whole restaurant and at the end of my meal the queue was quite long. When my bill arrived, I noticed that the prices weren’t quite consistent with the menu. It didn’t add too much overall, so I didn’t mention it, but it’s worth a check to make sure you’re not going to be overpaying much. 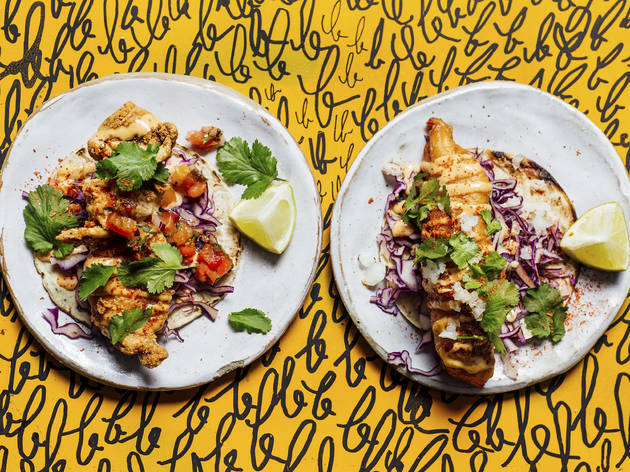 I first stumbled upon Breddos Tacos when I was living in Haggerston, they had a residency next to the canal and as soon as I had their fish tacos, I was hooked; so t’s not surprising that they’ve gone from strength to strength, and now with a permanent establishment. 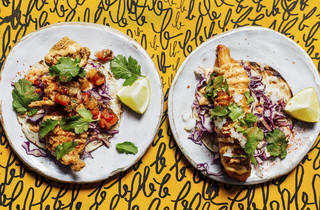 They make the best fish taco’s - delicately fried crunchy morsels of fish with a great tang; so naturally, I was really eager to see what magic this mashup would bring, given Som Saa is also another favourite of mine (the best thai around, with a more authentic thai chilli level, for those who like spice!). The chicharrón were average to be honest - I’ve had homemade chicharrón which were out of control (it did take three days to make!). The most stand out dish was the carne asada - the meat was so tender, herbs fresh and crisp and a great amount of kick in spice. The fried chicken was also a favourite with it’s light batter and moorish spices. The other tacos were good, but didn’t stand out as much as the carne aside and the fried chicken. Those margarita buckets were nice and strong too! Overall a great boisterous experience and would definitely be looking out for more mashups in the future. Tip: do drop in early to get a table, and they also do takeaway - win! Make sure to check out their Instagram for more future mashup events. Good For: small groups, quick feed, catch up with friends, casual lunch/ dinner, casual date night. Really disappointing. Called in advance to make sure we would be able to order take out for 8 people for a meeting and was told it wouldn't be possible until 1:30pm. I rescheduled the meeting, but when I went in in person to order, was told they wouldn't be able to do take out at all that day. Had to frantically re arrange lunch for 8 people at the last minute. I'm sure the tacos are delicious, but don't get take out! Fantastic-tasting tacos and this is coming from a taco snob. I got the sweet potato and egg tacos and the prawn tostada and was very impressed with all my options, tastewise. Lovely corn tortillas filled to the brim with ingredients and a good amount of prawns on the crunchy tostada. The sweet potato in particular had a strong spice to it that made my eyes water briefly but it was very tasty. Each comes with a lime wedge. Our server was mostly on point in such a crammed, busy, LOUD place. He was very jokey with us which helped. Orders can take a bit to arrive so just keep that in mind. My only grip was with the wine servings- such a teeny tiny pour for 4 pounds! The white wine was decent; not overtly dry as I would have liked but not too sweet. The margaritas were lovely but filled with too much ice. Keep in mind like I said before this place is LOUD. if you sit at the communal table in the centre, be prepared to raise your voice significantly and lean close to hear your mates. My final gripe is about the prices at £3.5 for one taco abouts or £7 for one tostada. It adds up quickly as the tacos are not large. 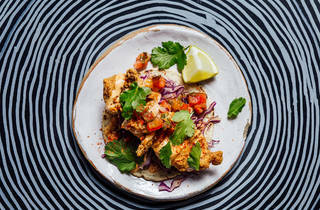 Tacos are just becoming a thing in London and I love seeing new taco restaurants pop up in every neighbourhood because those little bites of Mexican goodnesses are one of my favourite things to eat in the world. So I was ecstatic when I found out the Dinerama staple Breddos Tacos were opening a permanent site. 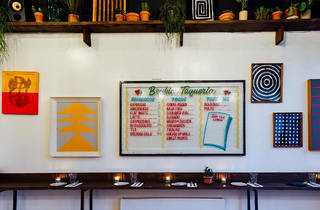 When I finally paid a visit to their new location the atmosphere was great; with cosy, small tables, dimmed lights and colourful food - how a Mexican taco joint should be. When it came to food, I couldn't help but compare them to the tacos I had in the USA and did not feel the same magic. As I remembered how life changing the fried fish tacos from a little truck in LA for 2 dollars were, I couldn't help but expect the same experience with every new taco I tried but nothing was mind blowing. Still a good fun fiesta vibe to go back to accompany a margarita or two. Straight up flavour kicking amazingness!!! !